Each year, Catholic Campus Ministry and United Campus Ministry bring students to Boston for a tour of downtown led by people who are or have been homeless. This tour gives students the opportunity to learn firsthand about homelessness, and to get the answers to questions such as: Where do homeless people go at night? How do they keep warm? Where do they find food? How do they keep themselves safe? What do I do when I see a homeless person on the sidewalk? As they walk Boston’s streets, students also offer food and clothing to the homeless they meet along the way. In 2015, this tour will take place on Saturday, September 26. The Friday afternoon before the tour, participants that are available pack backpacks and other sturdy bags with new socks, underwear, gift cards for a fast-food restaurant, and tarps, all of which have been donated. On Saturday, we leave in a carpool from the Reflection & Spiritual Care Center at 8:00 a.m. 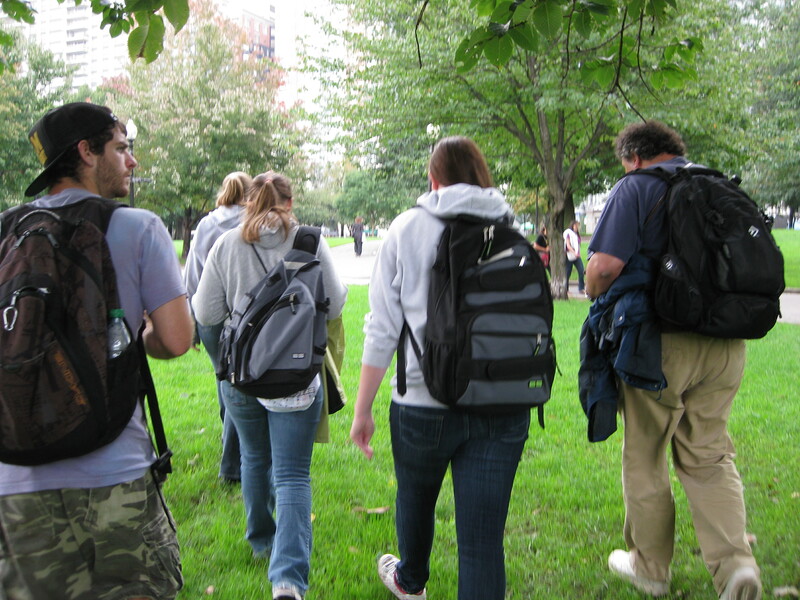 Carrying the bags, we meet our tour guides and begin walking the streets of downtown Boston. As we see homeless people along the way, students approach them in pairs, offer them bags, and chat with them. We stop to purchase lunch (or you can bring your own) and reflect on the morning. Then we continue the tour until about 4:00 p.m. We return to Plymouth State around 6:00 p.m. and continue our reflections over a light supper that is provided. Note: No religious affiliation is required to go on this trip. What have students who have gone on this trip thought about it? Read some of their reflections. In 2015, the cost of this trip is $25. Sign-ups begin Friday, September 11. To sign up, bring a $15 non-refundable deposit to the Reflection & Spiritual Care Center, open Monday – Wednesday and Friday 10 a.m. – 4 p.m. and Thursday 11 a.m. – 3:30 p.m. The final balance of $10 is due Wednesday, September 23. If you need help paying for this, let us know; the cost should not stand in your way of going on this trip. Space is limited, and a waiting list will be created, if necessary. For questions, contact Kathy Tardif (kmtardif (at) plymouth (dot) eduor 535-2673), Catholic Campus Minister.